Born 1864, Bern, Switzerland; died 1930, Bern, Switzerland. 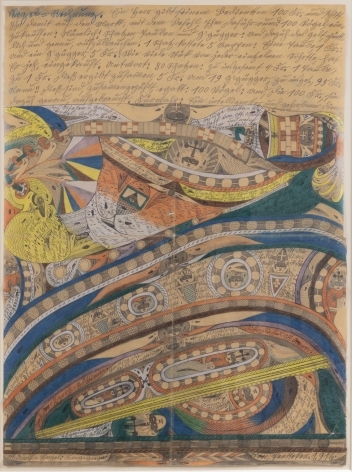 One of the most hallowed artists in the pantheon of Outsider Art, Adolf Wölfli is responsible for inspiring the earliest attempt to truly recognize the Outsider as an artist. Born in Bern, Switzerland in 1864, Wölfli was orphaned at age 10, and endured consistent sexual and physical abuse within the state foster system. He worked briefly as a farm laborer until, following a series of prison terms for attempted child abuse, he was diagnosed with psychosis, and in 1895 was committed to the Waldau Clinic in Bern, where he lived and flourished creatively until his death in 1930. Although he wrote a brief prose autobiography not long after entering the Waldau, Wölfli’s first drawings do not date until 1904. These works drew the attention of a psychiatrist at Waldau, Dr. Walter Morganthaler, who recognized his talent, and responded to the challenge of honoring it as more than simply a symptom of mental illness. Morganthaler published a seminal study of Wölfli’s work in 1921 entitled A Mental Patient as Artist with the intention of positing a universal psychological theory of creativity, earning Wölfli unprecedented recognition. In 1908 he began his autobiographical magnum opus of 2500 pages of both drawings and collages, filling 45 bound volumes. He also produced a significant archive of smaller, decorative works he called “bread art,” as they were intended to bring in a small income to pay for basic art supplies. Stone, Lisa, Accidental Genius: Art from the Anthony Petullo Collection, New York, Prestel Publishing, 2012. 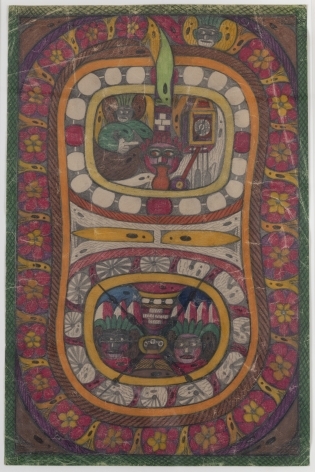 Spoerri, Elka, Adolf Wölfli, Daniel Baumann, and Edward M. Gomez, The Art of Adolf Wölfli: St. Adolf-Giant-Creation, American Folk Art Museum, New York, 2003. Spoerri, Elka, Adolf Wölfli: Draftsman, Writer, Poet, Composer, Cornell University Press, Ithaca, 1997. Morgenthaler, Walter, and Aaron H. Esman, Madness [and] Art: The Life and Works of Adolf Wölfli, University of Nebraska Press, Lincoln, 1992.
book, titled “From the Cradle to the Grave” (1908-1912), is an imaginary autobiography as a child, engaged in fantastical adventures. These compositions are framed by the artist’s signature ornamental border, and are marked by composite perspective, intricate cityscapes, and a mix of text and image, including his unique bestiary of ornamental birds and self-portraits, which change as the narrative evolves. In the following book, “Geographic and Algebraic Books” (1913-16) the artist’s mythical alter ego is canonized, morphng into St. Adolf II. The next two books contain thousands of pages richly layered with poetry, coded musical compositions, and collages that have long captivated not only art audiences but also composers and musicians: “Books with Songs and Dances” (1917-1922), and “Album Books with Dances and Marches” (1924-28). He produced a final book entitled “Funeral March” between 1928 and his death in 1930. Composed not with musical notation but rather with a hybrid phonetic-numeral system exploring an image or images collaged onto the same page. The scope of Wölfli’s genius has only begun to be fully explored in major exhibitions, and continues to present us with new discoveries and surprises. 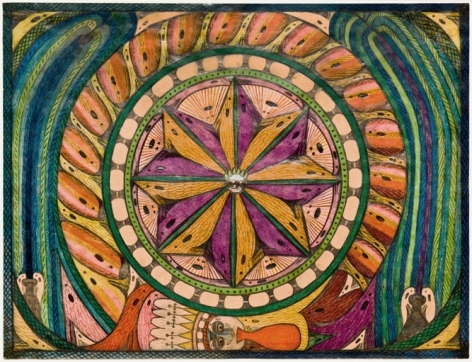 As is true of many Outsider Artists, Wölfli has influenced generations of artists who have looked not only to his work, but also to the example of his singular dedication to his artwork.